June 2009 marked the 65th anniversary of the Normandy Landings by the Allies. This assault, together with other campaigns in NW Europe, southern France and Italy, would lead to the Liberation of France and ultimate Victory over the Axis Forces. While many people have a lot to be thankful for these events of WW2 – and there is much to celebrate – there was a price for Ultimate Victory. 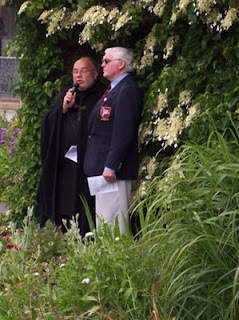 A number of commemorative events were organised by the Normandy Veterans Association, the British Legion and others in France, Britain and elsewhere to mark the Normandy Landings of 1944. 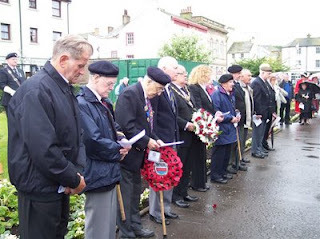 The above photographs show the commemorations on Saturday 6 June 2009 at the West Cumbria Normandy Veterans Memorial, St Nicholas’ Church Gardens, Whitehaven, Cumbria. For additional information click on ‘Comments’ below. "The 'search' facility on People's War is currently not working. We aim to rectify this problem in the near future. We apologise for any inconvenience this may cause." This can make it very difficult for users to find a particular story, event or person. This is especially so for those stories that were assigned to an incorrect category or region by the BBC website team towards the end of the project by applying Bayes' Theorem. For example some stories I posted which were about wartime life in Preston, Lancashire were categorised under London rather than Lancashire. It is not easy trying to find who to contact in the BBC to see if this is likely to be resolved! So, I have recently sent a message via the 'technical fault' page of the BBC website. Hopefully, it will be resolved in the near future. "Until the day break ..."
Medals for Mary ... after more than 70 years! "When They Sound The Last All Clear"